Wild geranium (Geranium maculatum) of the Geranium (Geraniaceae) family is an herbaceous woodland perennial that blooms in early spring. In the U.S., this species is found from Louisiana and Oklahoma to Florida and north to North Dakota and Maine. 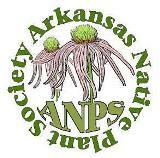 In Arkansas, it is found primarily in the highlands of the northwestern half of the state. The genus name is based on a Greek word meaning “crane” in reference to the shape of the plant’s fruit which resembles a crane’s bill. The specific epithet means “spotted” in reference to leaf spots that may or may not be present. Other common names include spotted geranium, spotted crane’s-bill and wood geranium. Preferred habitats are wind-protected, lightly shaded, mesic deciduous woodlands and borders with various well-drained soils, but it may be found in sunny sites with consistent moisture. Plants may wilt on hot, windy spring days and may enter early dormancy if drier conditions persist. Wild geranium, a long-lived plant, has stout, dark-colored, round, shallow, rough rhizomes with a light orange interior. Nubs develop along the sides of rhizomes that may grow into rhizome branches. Fibrous roots grow from the lower sides of rhizomes. Leaf and stem growth originates at the tips of rhizomes. With mature plants having many growth tips on relatively short rhizome segments, a mature plant develops a rounded mound of leaves. A plant may have a spread of 2 feet or more and reach a height of 1½ feet tall. Photo 1: A partial rhizome and plant (detached from main rootstock at light orange area). This rhizome segment has several branches, including a small branch on the right side. Photo 2: A relatively small young plant. Note wide uncleft area at center of leaves as well as flower buds making their appearance (see top center and lower right). White flowers in upper left are those of rue anemone (Thalictrum thalictroides). Shortly after the leaf mound has formed in late winter to early spring, clusters of football-shaped flower buds become visible across the leaf mound, as stout, unbranched and heavily pubescent floral stems rise above the basal leaves. Stems, five sided (more pronounced on larger stems) with downward-trending prominent pubescence and one or more pairs of cauline (stem) leaves, grow from rhizome tips surrounded by basal leaves. Stems continue to grow until buds are well above basal leaves and the lowermost pair of cauline (stem) leaves is positioned just above the basal leaf mound. As flowers reach anthesis, stems (with inflorescence) may have a total height of 16 inches with 10 of those inches below the lowermost cauline leaf pair. The lowermost pair of cauline leaves subtends two or three erect, light green to reddish secondary stems that may be 5 inches long. These secondary stems, in turn, support one to three peduncles (stalks of inflorescences) from which several pedicels (stalks of flowers) grow that are also subtended by leaf pairs. Leaves of the lowermost cauline leaf pair have the same appearance and size as basal leaves, but with petioles that are from ¾ inch to 4 inches long. Leaves that subtend pedicels have the same texture as other leaves, but appear three lobed at about 2 inches wide, with short petioles or perhaps sessile. Photo 3: A single pair of cauline leaves subtends an upper secondary stem and two lower peduncles. Note the small leaves on the secondary stem and bracts at bases of stems, peduncles and pedicels. At anthesis in early spring, 1½-inch-diameter, upward-facing flowers are light pink to lavender with whitish centers. Flowers have five obovate overlapping petals and five light green pubescent, slightly ridged and elongate sepals. Sepals have acute apices that terminate in needle-like tips (cuspidate). Petals, with broadly rounded upper margins, surround ten stamens and a pistil. Stamens, connecting to the flower’s axis below a hairy ovary (superior ovary) of five carpels, have white slender filaments with elongate yellow anthers that bear yellow pollen. Pistils have a long slender whitish style that branches into stigmas, spread wide and curved backwards. Styles attach to the smooth, round-elongate, green sections of the ovary. Individual flowers, up to about ten to fifteen per stem in pairs or in loose clusters, are in bloom for one to two days. Total bloom time for a plant extends over about three weeks. Cauline leaves wither in late summer, well after seeds have dispersed. Photo 4: Flowers, changing from pink to lavender, have widely flared, overlapping, obovate petals. Photo 5: Display showing flower buds (lower right), front and back of flowers and a flower past bloom (lower left). Note five-branched, back-curved stigmas. After fertilization of a flower, the lower portion of the style quickly elongates and the five seeds–one in each ovary chamber–enlarge so that the ovary becomes knobby. The stigmas wither so that a crane’s-bill-like fruit is formed. The fruit, an inch or more long, matures and dries to a dull dark brown rigid capsule. Five dark brown oval seeds, resting just above the drying sepals, are tightly held in place, capped by the ovary wall, which bears five long thin arms (springs) aligned along the style and firmly attached just below the dried stigma. When the seed-bearing structure is dry, each cap and associated spring-loaded arm snaps upward. With this instantaneous snap, the seed is catapulted a number of feet away from the plant. Caps and arms, now curled backwards, remain attached at their upper end to a dried woody style. Photo 6: The flower at lower position in display (sepals and anthers removed) exhibits a prominent pistil prior to spreading of stigma. The two fruits (sepals removed) show the closing of the stigma (more mature fruit at top of display), strong growth of their “bills” and enlargement of ovules. Photo 7: In this display, the central stem bears a green immature fruit and a brown fruit that is poised to launch its five seeds. Seeds (examples on left) of the other two stems have been launched with caps and arms curled backwards. For a partially sunny woodland garden, wild geranium is effective as a long-lived plant that is easy to cultivate. It has attractive form and foliage and showy flowers and fruit so that it is appropriate for specimen plants or as a groundcover. It is easily propagated by division. The only other widely occurring native species of the genus found in Arkansas is Carolina crane’s-bill (Geranium carolinianum var. carolinianum). This is a small weedy annual/biennial species with small palmate leaves and purplish pink flowers. Another Arkansas native species known from only Miller County is Texas crane’s-bill (Geranium texanum). Four non-native species of the genus are also found in the state. This entry was posted in Know Your Natives, Native Plants, Wildflowers and tagged Geraniaceae, Geranium, Geranium maculatum, Know Your Natives, Wild Geranium. Bookmark the permalink.